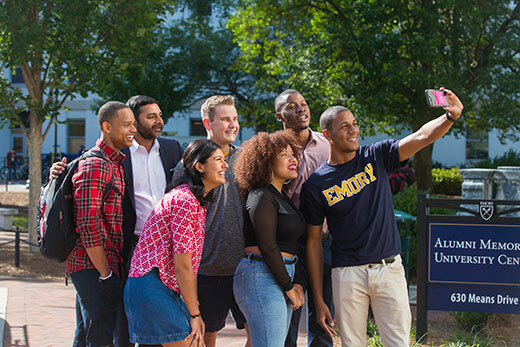 Ajay Nair (second from left), Emory’s senior vice president and dean of Campus Life, poses with students. Nair will leave Emory after March 31 to become the next president of Arcadia University. Ajay Nair, Emory’s senior vice president and dean of Campus Life, will serve as the next president of Arcadia University in Glenside, Pennsylvania. Nair will remain at Emory through March 31 and take the helm at Arcadia on April 2. Prior to joining Emory, Nair held executive leadership positions at the University of Pennsylvania, Columbia University and the University of Virginia. A Philadelphia native, he earned his bachelor’s degree and PhD from Pennsylvania State University. He will be the first person of color to serve as Arcadia’s president and one of the first American-born university presidents of Indian descent nationwide, according to Arcadia. Emory President Claire E. Sterk congratulated Nair on his appointment and praised his impact at Emory. As senior vice president and dean of Campus Life, Nair led more than 20 departments, from intercollegiate athletics and the Greek experience to Student Health Services, Residence Life and more. Campus Life offices and initiatives created under his leadership include Student Success Programs and Services; Parent and Alumni Relations; Belonging and Community Justice; Student Involvement, Leadership and Transitions (SILT); Racial and Cultural Engagement (RACE); and the Respect Program. Nair provided strategic direction on cultivating an ethically engaged community; co-chaired the task force that resulted in the development of Emory's nationally recognized open expression policy and educational program to foster debate, dialogue and deliberation; and was instrumental in creating the Emory Commission on Racial and Social Justice. He also provided leadership for the development and completion of several living and learning spaces, including the first-year residential village, construction of a new Campus Life Pavilion and a new Campus Life Center, renovations to athletic fields and several dining and student union facilities.